Livy and Julia have been best friends ever since the tragic death of Livy's younger sister, Kara. They treat each other like sisters so when Julia is found dead in her house, Livy is devastated and confused. Not willing to believe the report that Julia's death was a suicide, Livy begins to investigate on her own. Yet, what she finds out tears open a new hole that just might not be abled to fill. 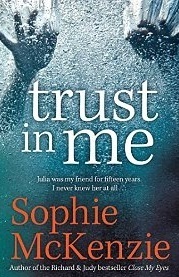 I've had no luck with thrillers this month, and that includes Trust In Me. Again this might just be because it didn't suit my taste but I was detached from the start right to the end. I found this to be unmemorable because of the plot, characters and writing. McKenzie is a great writer, don't get me wrong, but she just couldn't maintain my interest. The plot was a standard murder mystery that needed to be solved. However, instead of officials/authoritative figures cracking the case, we have your average suburban mum with a intuition she's determined to follow. It didn't really flow properly and the suspense just wasn't there. Of course I wanted to know who the murderer was but it was more because I wanted to be done with the book. There are snippets of the criminals diary entries which were interesting at first, and quite creepy, but then I just got lost in his drawl and couldn't keep reading it. Maybe that's why I didn't really understand how the person who was revealed as the murderer came to be the killer in the first place. There was no motivation revealed, just that he was there and biding his time. I couldn't connect with Livy at all, and I thought it was pretty unrealistic for her to pull off a CSI project with just basic sleuthing and attempts at interrogation. She was a really annoying character for me, raising suspicion without any logic and being naive when she just needed to think. The relationship developments were also a headache, and I really questioned her priorities in trust. I understand Livy had reasons to be apprehensive but she constantly got upset when no one believed so it frustrated me when she couldn't trust the person she was suppose to trust the most. However, I have heard that some people do relate to Livy so maybe it's just me and my age/experience. The other important character is Julia, but because she's dead before I even met her, I had to learn about her through other people. I would've thought that at the end I could've figured her out and understand her motives etc. but I got three different perspectives of her it was difficult to really comprehend. The plot already portrayed her as a mysterious character no one really knew, so I wasn't sure who to trust when they relayed what they knew about her. Still, it did reflect the novel in that everyone puts up a front and it's hard to decipher what their true form is. Exactly how the criminal was as well. It was a decent read, but not spectacular. Instead, I actually forgot I read it and had to remind myself to start it just to review before realising I had read it. I'm interested to see what other crime/thriller lovers think about this though, and if I'm the only one who just couldn't connect. Let me know!